East Central Veterinary Hospital offers up to date ophthalmological diagnosis and treatment of our patients. Referral to a Veterinary Ophthalmologist can also be easily and quickly accomplished if the situation demands. 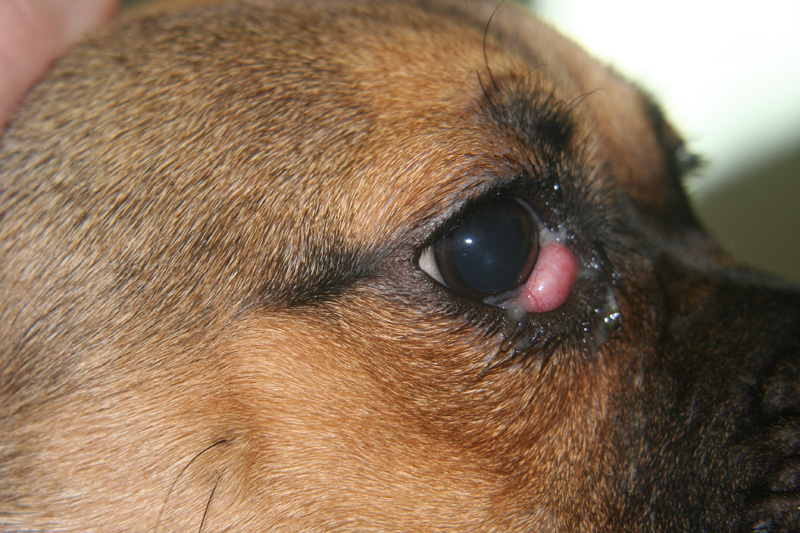 Eye problems are common in our pets. 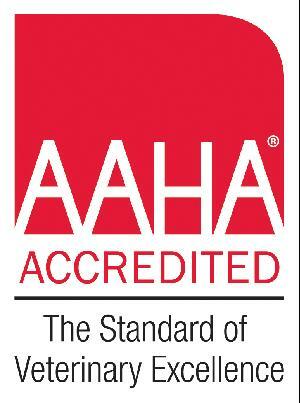 They are very important to diagnose quickly and accurately to preserve function and vision. What is involved in an eye examination? In addition to a complete physical exam, a few tests specific to the eyes will be performed as required. These include a fluorescein stain, a schirmer tear test, and an intraocular pressure test. The fluorescein stain test checks for ulcers or scratches on the cornea. If there is a scratch or ulcer, the stain will stay in place instead of being rinsed away. With a special light, we are then able to see the corneal scratch. A schirmer tear test measures the amount of tears produced in a specific period of time. The strips are placed in the lower part of the eye and then absorb tears from the eye. A low tear production predisposes to corneal ulcers, corneal fibrosis, pigmentary keratitis (brown pigment covering the eye and decreasing vision), and many other eye problems. Decreased tear production can also lead to dry eye (keratoconjunctivitis sicca) and long term eye problems. Intraocular pressure helps to diagnose glaucoma and in some cases, uveitis. Glaucoma is an increased pressure in the eye that can lead to blindness and chronic pain. Uveitis is an inflammation in part of the eye. Why can't I just wait and see if things get better? Due to the fact that problems with the eyes can potentially lead to blindness. Since our patients can't tell us if things are changing, it is highly recommended to have the eyes evaluated as soon as there is a problem noted. Just waiting may lead to changes that potentially can not be treated. Does my dog have cataracts? Cataracts are opacities in the lens of the eye. They are sometimes confused with a condition called nuclear sclerosis. Nuclear sclerosis is a normal aging change in the center of the lens. An examination can help to determine if your pet has nuclear sclerosis or cataracts. This eye has a hypermature cataract. Notice the brown pigment in the eye from chronic inflammation. 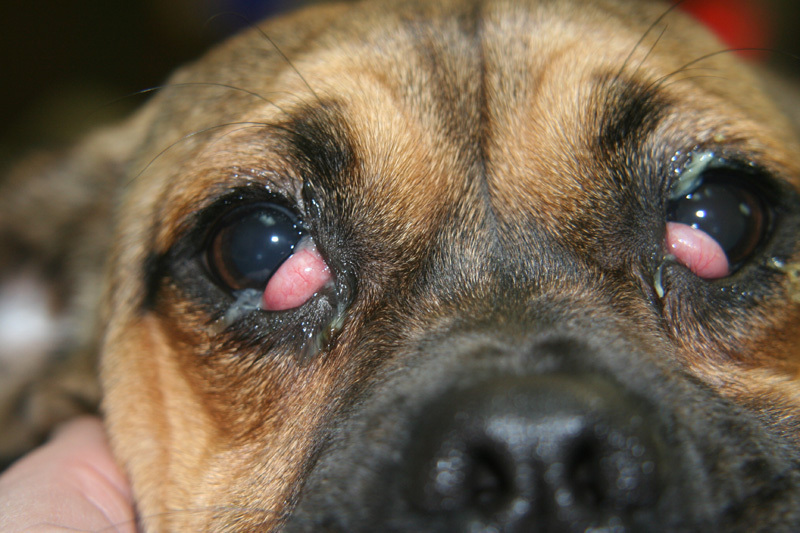 What is a "cherry eye"? This is a protrusion of the gland of the third eyelid. The dog and cat have a protective third eyelid (also called a nictitating membrane) just inside the lower eyelid. The third eyelid gland is a collection of tear glands and lymphoid tissue. Protrusion of this gland can lead to dry eye and conjunctivitis. It is recommended that the gland be replaced in its normal position to help prevent decreased tear production. 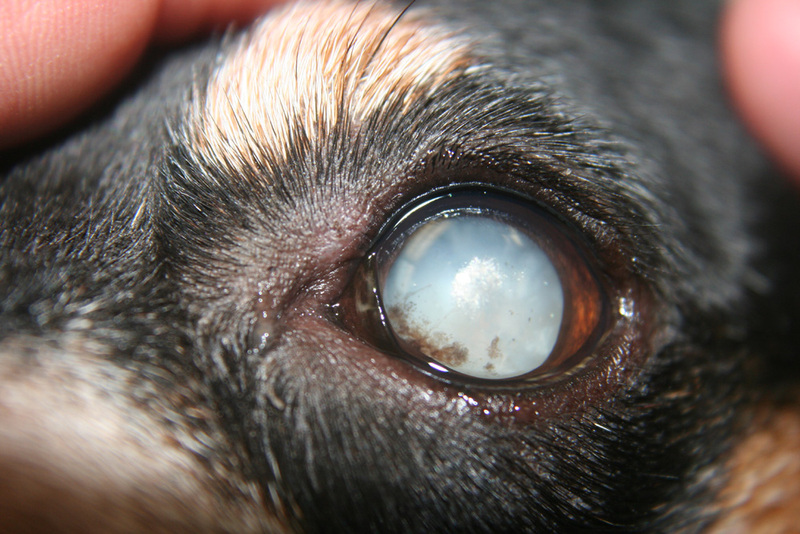 Above are examples of "cherry eye" in a young mixed breed dog. Notice the discharge secondary to the inflammation of the gland.